In January 1929, the reigning monarch of Afghanistan, Amir Aman Allah Khan, was driven from his capital by a former soldier turned outlaw. 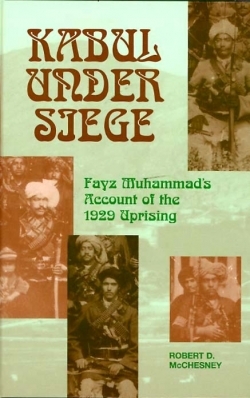 The uprising was a response to the ruler’s attempts to modernize the tribal culture of Afghanistan. Kabul, then as now, was of considerable symbolic importance, and its loss sounded the death knell to the king’s power and his reforms, much as the defeat of the Soviet-backed government in 1993 spelled the end of Marxist power in Afghanistan as well as its efforts at reforming this unyieldingly tribal society. Until now, there has been no account of the nine-month rule of the outlaw-king, Habib Allah, nicknamed “Son of the Watercarrier,” from inside the capital. This account of the occupiers’ extortion, confiscation, and the resulting hardships, as well as the actions of those who resisted, is a timely reminder of the drama being played out in Afghanistan today. This edition is also illustrated. Fayz Muhammad, author, was a Kabul resident and a well-known historian who had already published an authoritative history of the country. Muhammad chronicled the reigns of Aman Allah and his immediate predecessor and, during the occupation, kept a detailed journal, which forms the basis of this book. R. D. McChesney, translator, of New York University, is the author of War in Central Asia and other books.